G. Gordon, 'Considerazione su un disegno del Grassi' in Nicola Grassi e il Rococò europeo, Udine, 1982, pp. 72-3, fig. 65. T. Pignatti, 'Ancora sui disegni del Grassi' in Nicola Grassi e il Rococò europeo, Udine, 1982, p. 74, fig. 66. Venice, Fondazione Giorgio Cini, Disegni di una collezione veneziana del Settecento, 1966, no. 67, illustrated. 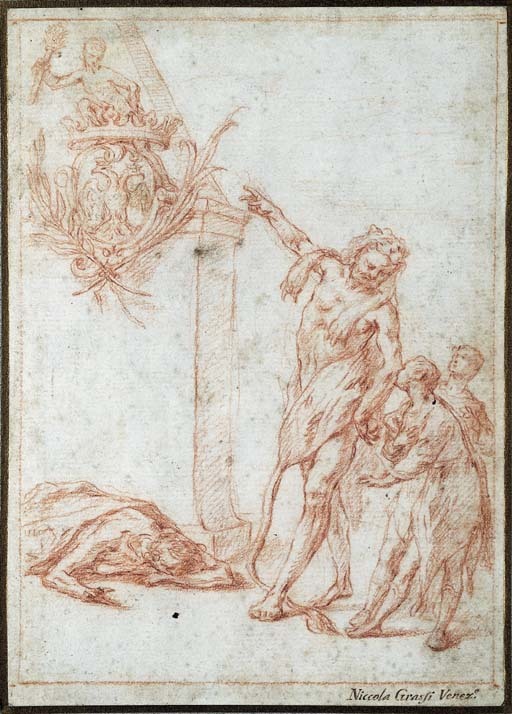 George Gordon has suggested that this sheet is a preparatory study for a decorative panel, perhaps never executed, destined for the sala maggiore of the Palazzo Sandi, G. Gordon, op. cit., p. 72. The major cycle of frescoes in the sala was executed by Giovanni Battista Tiepolo for Tommaso Sandi to illustrate the Power of Eloquence, celebrating Sandi's profession as a lawyer. This work appears to have been left unfinished on Tiepolo's departure for Udine in 1724-5. Gordon suggests that Grassi adapted his technique to fit the existing scheme and win the commission, a theory which also explains the slightly awkward compositional structure. The central element of this deduction rests on Gordon's identification of the coat-of-arms as that of the Sandi family, who on their enoblement in 1685 became the only Venetian family to sport an eagle as a crest. However, it has also been noted that Grassi counted a number of Austrians among his patrons, and it is not inconceivable that this coat-of-arms indicates an as yet unidentified Central European origin for the commission. Terisio Pignatti, on grounds of style, suggests that this sheet dates from Grassi's early period, T. Pignatti, op. cit., p. 74.